What does that have to do with SuiteCX? SuiteCX has mastered the concept of Inventory by creating a standalone map type in the software that acts as a Grid map, where you can strategically place each of your Customer or Brand Interaction points along an X and Y axis modeled by Lifecycle by Department or Channel. When we train and teach new practitioners how to organize their interaction points, we always start with Inventory because many companies and brands have never done the exercise of mapping out their entire marketing communications strategy as a current state snapshot. This effort in and of itself is a major milestone and deliverable. Many companies have not even agreed to the concept of their customer lifecycle and what words are most appropriate to use to describe those phases. Let alone, each interaction point along the x and y axis. Inventories can be at the overarching company level, or they can be just a snapshot into one marketing strategy or one customer purchase or product usage phase. An inventory can have as few or as many interaction points as is relevant to the effort. We have inventories with 400+ interaction points and we have some with as few as 20. What does this tell you and why does it matter? If you are thorough and you really “shake the tree” of the organization or team to extract all the critical interaction points, then you will have a full view of all the ways that you are “touching” your customer via all channels. Mobile, phone, website, in person, at the store, social media, email, etc. From this vantage point, you can start to append context. Appending context is where things really get interesting. SuiteCX treats each individual interaction point as a full knowledge database. We have over 170 attributes that can be appended to each interaction point. We encourage practitioners to think about each interaction point and the power that it has. Things like the emotional state of the interaction, is this a frustration point or a delightful experience? We encourage giving interaction points a score, some sort of value to indicate the importance or performance of this interaction. We also have a full set of metrics to append, as well as descriptive fields like findings and recommendations. Go deep! The more data we add here, the richer the story becomes. Think of inventory the way that you think of all the clothes you have in your closet. You have many tops, bottoms, shoes, colors. You have new clothes, you have older clothes. You have clothes that you wear to the gym, to the office, and out for drinks with friends, or on a date. Interaction points are like the individual pieces of clothing that you have in your closet. When it comes to doing journey maps, if you have all the “pieces” you can put together any kind of outfit that you’d like based on any combination of clothes. This is also how SuiteCX handles the creation of journey maps. Use the interaction points in Inventory to create your journey stories and create the area of emphasis that is most relevant to you. How does the tool allow for this? This is where SuiteCX excels for how it handles and manages interaction points i.e., your “data”. We believe in the concept of “create once and use many times”. Once your inventory is complete, you can query, sort, filter, and import those interaction points into any map template or style you choose. This takes your work effort down dramatically. It takes no time at all to create a journey story by finding and importing the relevant interaction points from the centralized database of Ipoints that we call “Inventory”. We are big believers in being efficient with your time! This map took less than 2 minutes to create because I could import my IPoints from Inventory where they are organized, stored, and appended with context. Don’t worry, once you create your inventory, you can continuously evolve it. 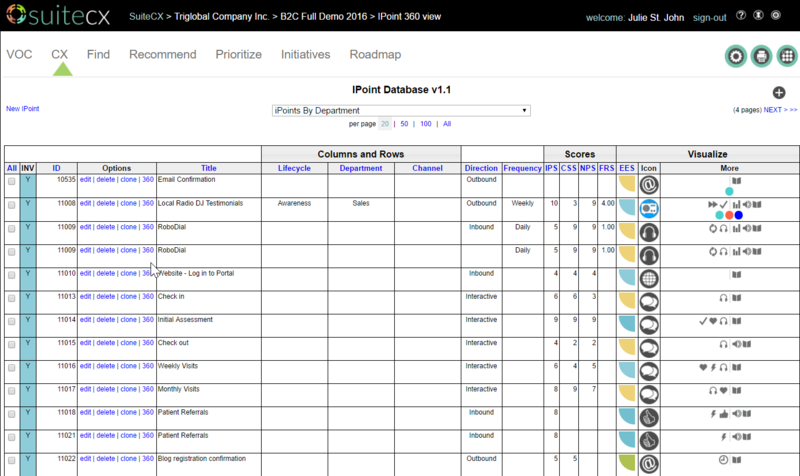 You can add more IPoints to it, you can increase/decrease or rename the lifecycle and department phases. You can remove IPoints from it. You can do whatever you wish. Whatever you do, because it is in Inventory, it is stored for your project, it is organized, and it is re-usable across the entire project. You only get 1 Inventory per project, so you will want to think in terms of a point in time or a “state” of being for each inventory. For your first project, the inventory will likely represent your “current state” or how things are right now. When you are ready to make recommendations for improvements, you will create a new project with a new inventory which will represent your “future state”. You can also create inventories and projects as a quarterly exercise to show progress over time, in which case you would just name each project for the quarter that it represents. Then you can take advantage of our statistics views and create a report on how things are going per quarter. Yes, we thought of that as well. Any changes made to an IPoint in Inventory will automatically propagate throughout the project to every map that IPoint is on. So, you will want to make all the updates in Inventory and just relax and trust the system that the changes you’ve made have propagated throughout the project. If you don’t want the changes to propagate for a particular IPoint, then we have a solution for that too. You can use our advanced data management view to clone that Ipoint which gives it its own unique ID and henceforth makes it unique, so it can have different attributes or contextual information like metrics, scores, findings, recommendations, and emotions. SuiteCX is a data management platform! Hopefully you have come to the conclusion, like we have, that SuiteCX is much more than a journey mapping software. SuiteCX is truly a data management platform. Created by data nerds and adored by data nerds, we are here to make sure that your inventory or “closet” is organized, searchable, continuously kept in order and ready to use!